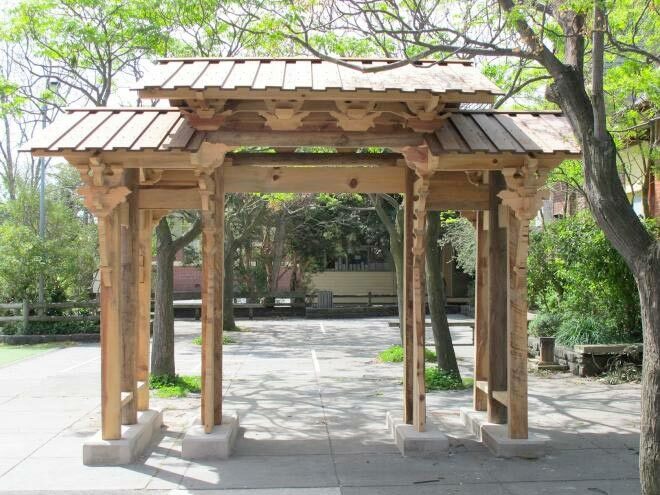 The full-sized gateway, based on a timber gate of a 12th century temple in Zhejiang province, was designed, built and erected by a group of Melbourne School of Design students under the guidance of Professor Qinghua Guo and ABP’s Workshop Manager Hamish Hill. The structure, which took a full semester to create, is the outcome of the ‘Craft in Traditional Asian Architecture’ studio which challenged students to research and employ ancient Chinese principles of design and construction. The group developed skills in cutting, joining and assembling timbers and also learnt the design history of gateways, the conservation of heritage property and intangible craftsmanship. As part of the subject, the students also had to propose potential sites around the country for the gateway. Student William Cassel suggested his old school Malvern Primary, as they have a sister-school relationship with a school in Nanjing and teach Mandarin to the students. The school community, led by Principal Richard Bennett’s and parent Richard Johnston (a graduate of ABP) not only agreed to incorporate the Gateway into their school grounds but got behind the project, building the foundations, supplying roof materials and organising permits. The Chinese Gateway, a gift from ABP to the school, will be officially opened at Malvern Primary School on Friday 1 November at 2.30pm.